Photo submitted by Nicholas Crapps, nephew. Not a day goes by that I don't think about Joe. He was my T.C. and cared very much about his crew. He saved my life by not letting me go with him on that day. I thank him and the Lord for that. I don't remember anything about my uncle. I was born 15 years after he was killed. I really don't know much about him at all, but I'm trying to learn what I can about the man everyone talks so highly of. My mom was going through some old pictures and found one of his grave marker and it had all of his information on it, so I used the information and found this site. After actually finding his name, I showed my mother and she started crying so hard. 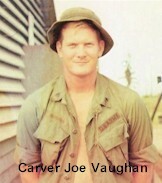 She and I both really appreciate you creating this remembrance about him and all of the others in Troop K.
Carver Joe and I went to first grade together and were friends up through high school. We both went to Lakeview Baptist church and elementary school. He went by Joe and not Carver. He was shy and quiet most of the time. He was a loyal friend and a good person. Joe was beloved by his family and friends. I still think of him and I when we almost won an egg throwing contest at a picnic. At this picnic this was big deal with big prizes. We came so close to winning. He was competitive, and I had to be the one who missed the catch. He was a real person with so much potential, so much life ahead and such a good friend. Bod Bless Carver Joe Vaughan.